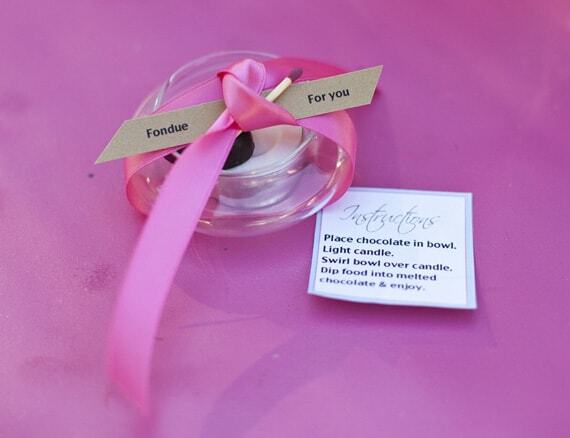 Little miniature dishes of chocolate fondue, to take home and light up at leisure. Perfect for anytime you want to say, thank you for coming in a very sweet way! 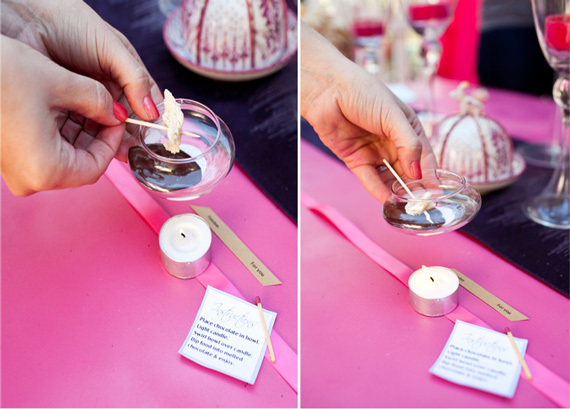 To create these fondue favors- combine a small piece of chocolate, a tea light and a miniature candle bowl (mine are from Micheals) together. 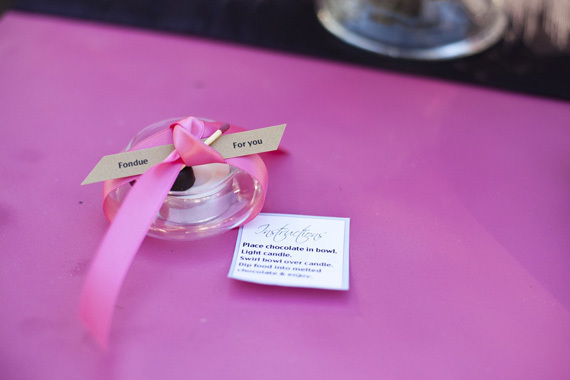 When giving the favors- place the chocolate, candle and note of instruction stacked inside the bowl. Top it off by tying with a pretty ribbon, a label and a small match to light the flame. Download the guest instructions here. Set out on a table with dippings to use, or send your guests home to experiment with their own melted selections. A sweet way to hand out a bit of thankful love. Photography done for me by Jackie Wonders. PS. These favors were featured in the Style Me Pretty newsletter yesterday, where they made my day by describing our site as an inspiring swoonfest. How fun!!! You site IS an inspiring swoonfest … well said! :) These favors are completely adorable. Eep-what an adorable favor! This is too stinkin’ cute! this is all sorts of adorable! awesome idea. What a sweet and clever idea! Going to try and remember this one! Fabulous idea! So easy, too! Those are so cute! Sign me up! Pingback: Funkytime- Design Juice, not from Concentrate! Cool idea. Only change id make is to substitute the glass candle holder with the black liquid potpourii burners you find at dollar tree. But this was a very creative idea. What a great idea! A fun simple way to get every guest involved! I love it!!!! If the glass is held over the flame long enough to melt the chocolate, won’t it be too hot to hold with your bare hands?